She dolls her herself beautifully on the auspicious day of Karwa Chauth and marks the day with a day-long fasting. To a day so devoted to love, delight her with an impressive Puja thali and give her a reason to glow in happiness just like these handcrafted thalis that come along with every puja item. A traditional yet beautiful festivity amongst married Indian Women, Karwa Chauth holds a universe level importance in their lives. They fast from sunrise to moonrise, doll up graciously and apply mehndi on their hands. They ornate their day by dressing well and pray wholeheartedly for their husband’s well being, longevity during evenings Karwa Chauth Katha and at the night while they bring an end to their fasting. And to do, one thing remains common. Wondering what it can be? Well, it is the Karwa Chauth thali! That’s right, auspiciously coupled with all the required ingredients, these help the ladies to religiously dedicate their prayings for their husband. Of course, if you are the husband or the wife, you can go on a search hunt and buy Karwa Chauth Thali and its items by roaming from street to street. But how about you order Karwa Chauth Thali online and leave no stone unturned to make the Karwa Chauth celebration a grander one? And to help you out, FlowerAura is ready with a diverse array of Karwa Chauth thali both for mother in law and for yourself at your fingertips. All you need to do is order a perfect pooja thali online that comes with all the necessary items and voila, you don’t need anything else to add up to the Karwa Chauth Fervor. 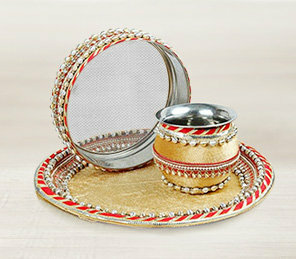 FlowerAura’s exclusive Karwa Chauth Pooja Thali is made for the special moment that can’t be put into words. Celebrating the holy union of a married couple, these pooja thalis help to make the occasion propitious. The list of Karwa Chauth Thali items available on the online gift shop of FlowerAura goes wide from edible ones like the Rasgulla, coconut, Ladoos, dry fruits all the way to the traditional Karva, pooja Katha book, Thal, Chhalni, and further to the beauty products such as nail paints, lipsticks, and bindi. And apart from the traditional Karva Chauth thalis wrapped in bandhani wraps, we avail you to exclusive ones as well where the thalis are enveloped in pearls or are beautifully adorned with Ganesh, the holy deity. So, no matter which one you choose, FlowerAura caters to send Karva Chauth thali online everywhere across India via its instant delivery that avails you to order Karva Chauth thali and relish every bit of the occasion without going out in the sun and avoid the crowdy bustling shopping streets. These can be sent as a surprise to your wife who has no clue that is up to some celebrations or to your mother who is toiling in her daily chores that she is nowhere near to go out and buy a pooja thali for herself. Reaching out to the remotest cities to the country, FlowerAura via its swift delivery across India and special features like free delivery and prompt customer care services caters to revive the festivity in its utmost vigor and fervor. The hassle-free online delivery caters to keep the thali intact with its items and hand-deliver your heartfelt emotions straight to your wife. FlowerAura’s same-day delivery option ensures to honor your marital bond by delivering the surprising tokens within the same day and helps you take the occasion to a whole new level by availing you free shipping with every order you make. So, if you are still caught up in browsing Karwa Chauth thali set online, FlowerAura can ease up the situation via its express delivery and by delivering Karva Chauth puja thali online right on time. So, if Karva Chauth is a month away or is about to be celebrated within few days, grab your perfect exquisite pooja thali for your wife and bag up the reward for being the best husband right away.